India-born economist Gita Gopinath was appointed the Chief Economist of International Monetary Fund (IMF). She will take over as IMF chief economist after Maurice Obstfeld retires in December 2018. It makes her second Indian after former RBI governor Raghuram Rajan to hold the position. 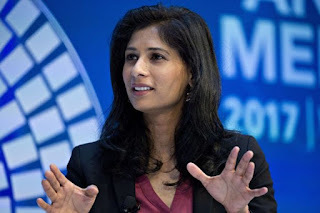 Gita Gopinath was born and brought up in India. She is a US citizen and an Overseas Citizen of India (OCI). She had received her Ph.D in economics from Princeton University in 2001 after earning BA from Delhi University and MA degrees from both Delhi School of Economics and University of Washington. She joined the University of Chicago in 2001 as an Assistant Professor before moving to Harvard in 2005. She became tenured Professor there in 2010. She is John Zwaanstra Professor of International Studies and of Economics at Harvard University. Her research focuses on International Finance and Macroeconomics. She is a co-director of International Finance and Macroeconomics program at National Bureau of Economic Research, visiting scholar at Federal Reserve Bank of Boston, member of economic advisory panel of Federal Reserve Bank of New York, co-editor of American Economic Review, co-editor of current Handbook of International Economics. She was managing editor of Review of Economic Studies. She is currently the Economic Adviser to Chief Minister of Kerala and had also served on advisory panel for G-20 issues for India's Ministry of Finance. In 2014, she had made into IMF's list of 25 economists under 45. She was also chosen as Young Global Leader by World Economic Forum (WEF) in 2011. Q. Which India-born economist was appointed the Chief Economist of International Monetary Fund (IMF)?